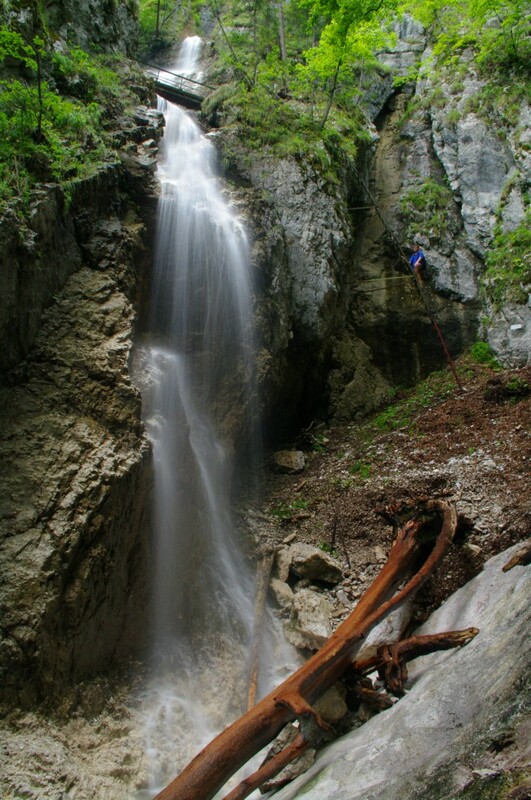 Surely the biggest attractivity of the Slovak Paradise National Park are its wild canyons and gorges full of waterfalls. 9 of them are accessible for the tourists by adventurous tourist trails equipped with special ladders, bridges and catwalks, which together with almost untouched nature environment makes it a must-visit for all the adventure seeking hikers. Climb all the ladders and enjoy the astonishing feeling of conquering your fears! All the gorges of the Slovak Paradise except of Ferrata Kyseľ are open all-year long (unless special occasions like floods, etc. appear). It is possible to pass them only one way, from the bottom to the top and then there are another routes for descent. Before your hike to any of the gorges make sure you have a good, sturdy hiking boots, a waterproof jacket, an insurance for hiking (you can get it very simply by an SMS) and a number for the Rescue service in your mobile phone. We are inviting you to get to know the most famous and favourite gorge in the Slovak Paradise, Suchá Belá. The hiking trail starts right next to the tourist centre in Podlesok, close to the Hrabušice village. The hiking trail is marked by green signs. Warning! If you are not an advanced hiker with proper equipment, we do not recommend this hiking trail. There are many difficult parts you must pass by climbing upon the steel ladders. The most beautiful, but also, at the same time, the most difficult part of the gorge, is a 40-metres high system Misových. The narrowest part of the gorge is serried by high rock boulders, followed by the Okienko waterfall with a romantic rock window. There are several ways to finish the hiking trail up. You can rent out a bicycle at the end of the gorge during the summer season and cycle down the hill back to Podlesok by the dirt roads. You can also continue by following the blue signs, which turn to the red ones later on, at the top of Glac to Gerava. Or you can follow up the yellow and red signs so you get to Kláštorisko. You can climb the gorge (as well as the others) only in one way, up the hill. 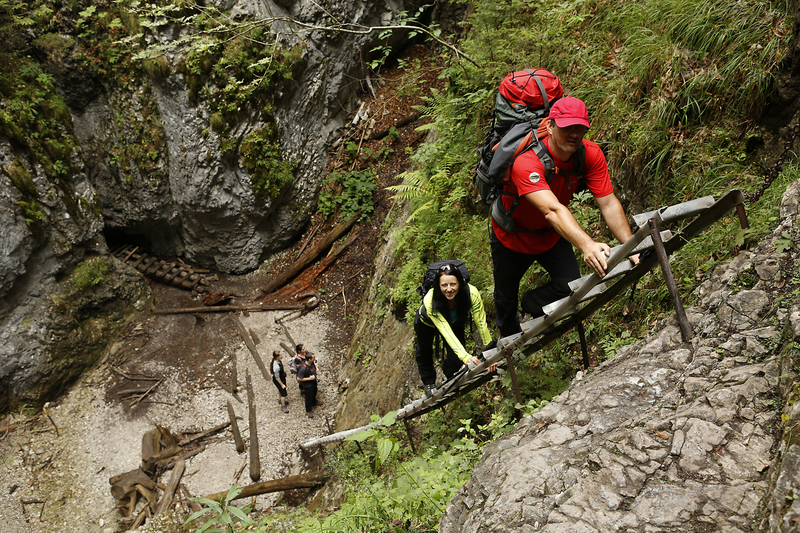 If you don’t feel like hitting some long and exhausting hiking trail, you should visit Kláštorská Gorge, which is situated deeper in the Slovak Paradise. It’s an easier option compared to the Suchá Belá hiking trail or other big gorges, but the waterfalls are gorgeous as well. You can get there from Letanovský Mlyn or from Podlesok through Prielom Hornádu, The gorge pathway is green-marked and ends up in the centre of the Slovak Paradise, at Kláštorisko. If you don’t like the overcrowded places such as Suchá Belá in summer, we recommend Hrabušice –Píla to you. You only need to pass by Podlesok and continue to a lovely Gorge Piecky. Follow up the yellow marks, which will get you through the unspoiled nature with many waterfalls and cascades around. 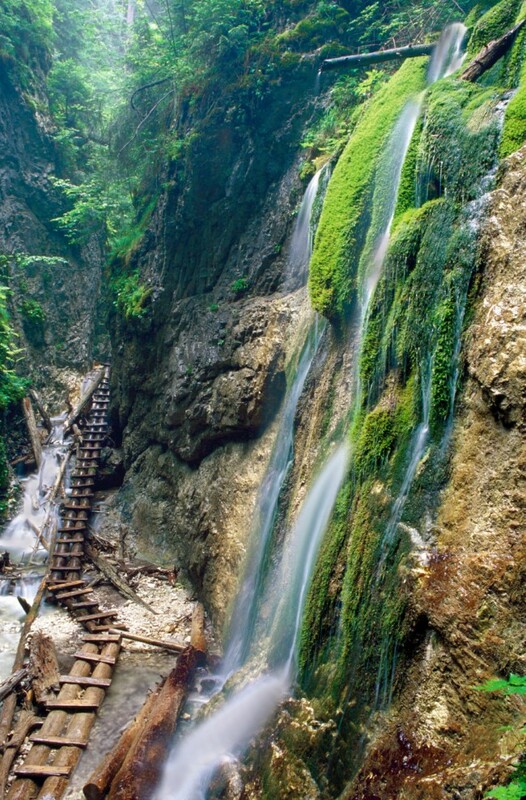 It’s said the Big Falcon Gorge is the longest and one of the most pleasing gorges in the Slovak Paradise. But at the same time, it is the least visited one. This gorge is the most difficult gorge to be hiked. If you are brave enough on the adventurous ladders and footbridges above the waterfalls, you can enjoy the view over the pristine nature with no crowds around. If you are an extreme hiking trail lover, you surely shouldn’t miss the Falcon dale Gorge. 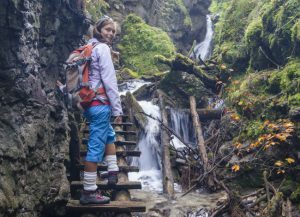 You will find an incredible adventure on this hiking trail, such as a ladder and bridge system or a 70-metres high Závojový Waterfall, which is the highest waterfall in the Slovak Paradise. We recommend you to start this amazing hiking trail from Čingov resort, continue along the Hornád River and then along the Biely Potok Valley (Kyseľ direction). 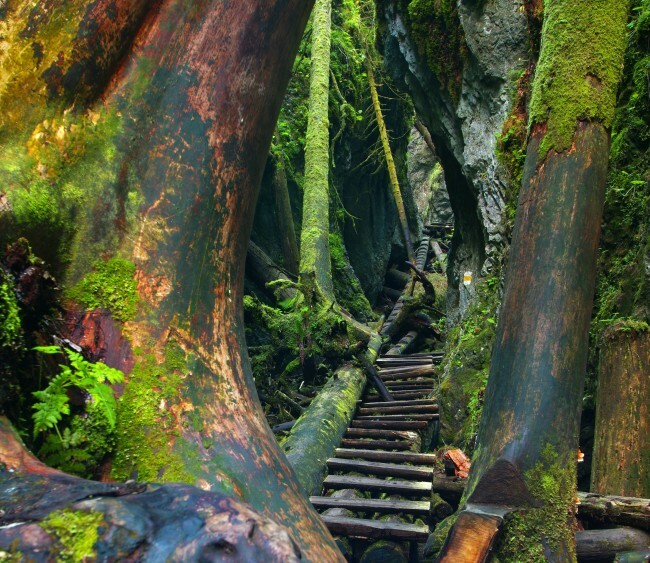 The hiking trail is difficult, therefore it’s suitable only for very experienced hikers with no fear of heights. 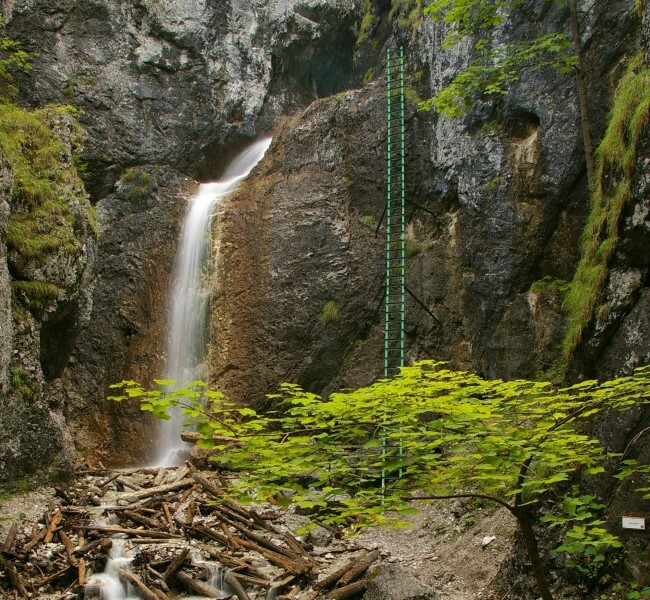 Zejmarská gorge is the shortest and the least difficult one in the Slovak Paradise. It’s also the only gorge in the southern part of the National Park. The hiking trail starts in Biele Vody and it’s recognized by blue signs. You can easily make the whole hiking trail within an hour, if the weather is good. There’s a snack bar at the end of the hiking trail in hotel Geravy. The trail is ideal even for less experienced tourists and the families with kids. You succesfully got to the Kláštorisko in the middle of the Slovak Paradise and you still have some energy left for another gorge? 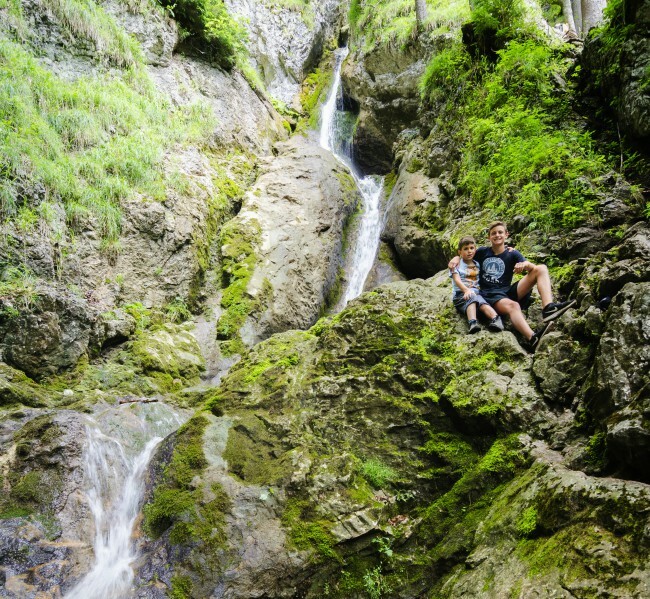 Then we recommend you to visit Gorge Kyseľ, hidden in the heart of the National Park. Gorge Kyseľ consists of three branches. Through the main branch leads the popular Ferrata Kyseľ, but there are another two branches, Big Kyseľ and Small Kyseľ (Veľký Kyseľ and Malý Kyseľ), which are also beautiful and in which is no need of special ferrata safety set. They are both situated about half an hour walking from Kláštorisko. There are several beautiful waterfalls in them, like Moss Waterfall (Machový vodopád), Nature Conservator´s Waterfall (Vodopád ochrancov prírody) or Waterfall in the Barrier (Vodopád v bariére).